All Woodward students are asked to participate in service to their school and communities each year. The School believes that the regular practice of service to others is enriching, enlarging and sustaining to those who participate, and we believe that the experiences and benefits that flow back to our students will direct them toward a lifetime of goodwill and service to others. Students participate in school wide and class service projects at school, and beyond. They have worked in service to the Greater Boston Food Bank, Father Bill's, Boston Children's Hospital, Pennies for Patients, Susan B. Komen Foundation, Promises for Purple, Quincy Animal Shelter, Toys for Tots, Coats for Kids, Belle of the Ball, ALS Foundation, and Wounded Warriors, among others. 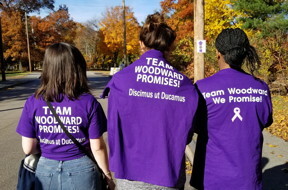 Woodward students are led and receive ongoing support and direction concerning their service requirements through the school staff, parents, and Woodward Women of Distinction in our greater community. Woodward seeks students “who are committed to advancing their educations and lives, as well as the lives of others, through hard work, high standards and service. Woodward students are expected to be thoughtful, compassionate and conscientious members of their communities.” The Susan King Taylor Award is presented annually on Recognition Day to students who have exemplified this standard, through acts of service to school and community. The Award is named after Susie Taylor, who became famous for her volunteer service during the Civil War. She escaped from slavery at the age of 12 and was teaching freedmen by the time she was 16. During the war, Taylor met Clara Barton, founder of the American Red Cross, who inspired her. Taylor volunteered as a nurse and launderer for Black Civil War troops as she traveled with her husband's unit, the 33rd United States Colored Troops. She formed the Boston Branch of the Women's Relief Corps after the war. Her memoirs, published in 1902, became the only written record of Black volunteer nurses in the Civil War. She was a women in service to others, and a model for Woodward girls.